Earlier this month I was fortunate to work on a new fashion fundraiser, Lunch with Margaret and George, to raise money for The Princess Margaret’s Gattuso Rapid Diagnostic Centre. 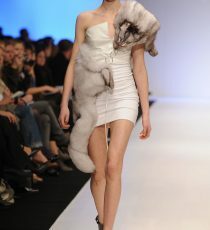 The brainchild of Toronto boutique George C owners, George and Lisa Corbo, it featured a runway presentation of Giles Deacon’s spring 2012 collection. 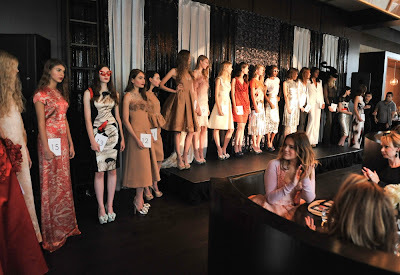 Guests were treated to a champagne lunch at Scarpetta in the Thompson Hotel followed by an old-school atelier show and a live silent auction. Giles Deacon could be your new best friend. (Wait, please mine.) It’s impossible not to like him when he’s so easy going and nice. 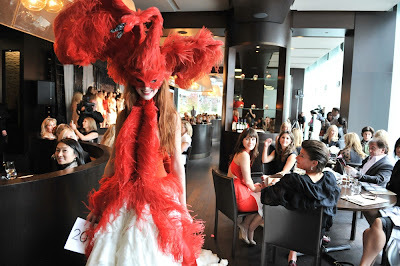 And getting to see his work up close and on models was a treat – feather headdresses don’t come around Toronto too often! The event raised $200,000 for the Princess Margaret. There is already buzz about who will be featured next year, but I’ll bet they are on the racks at George C. I just hope they are as nice as Giles. All photos by George Pimentel. The Superbowl may be over, but as far as I’m concerned the real games are just beginning. It’s the start of Ready-to-Wear season when designers will be fiercely competing on runways around the world for international attention and investment. 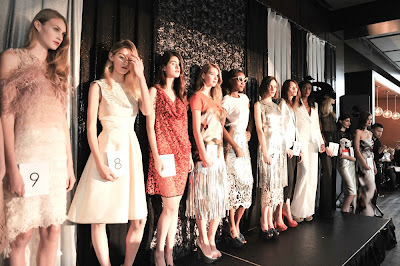 Of course, runway shows are a different kind of spectator sport than football or hockey. Let’s be honest, they’re usually viewed while the boss is out to lunch or late at night, just you and your laptop. But in the vein of “more is better” I encourage you to do your hair, don a great pair of shoes and pour yourself a glass of bubbly while indulging in a live stream (where available) or a photo slideshow. Montreal’s calendar includes many of the usual suspects – Barila, Bodybag by Jude, Nadya Toto – plus a peak at Rudsak’s new label RUD. Denis Gagnon, along with Marie Saint Pierre, tops this list of must-see shows. As well, the young Montreal-raised, London-based Thomas Tait will debut with Christian l’Enfant Roi and Samule Mercure in a group show presented by Trusst. Live streaming available. Plenty to heart about New York’s calendar. 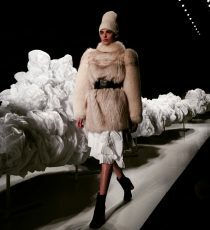 The pro set of Michael Kors, Calvin Klein, Donna Karan and Betsy Johnson ground the week. 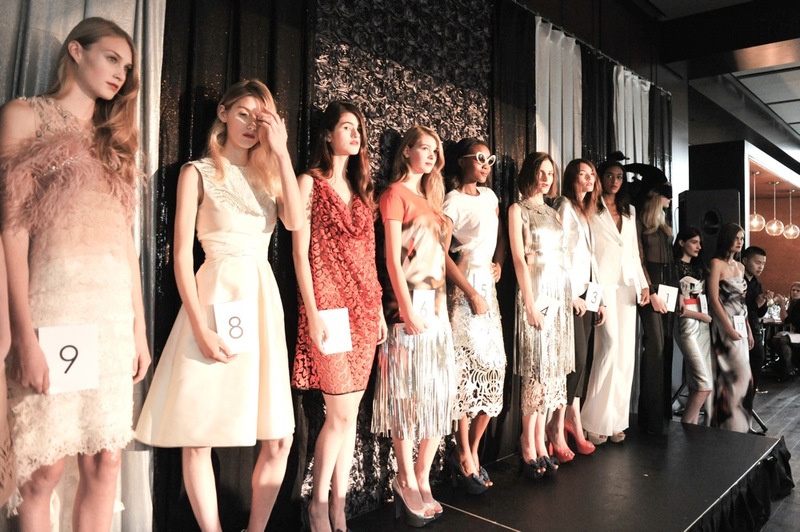 Mix in the glamour of Badgley Mischka, hipster chic of Charlotte Ronson and celebrity shows like L.A.M.B and you have something uniquely New York. Live streaming available for some shows. With an eye on emerging talent and international designers (including Mackage) Scoop appears to be modeled after New York’s Coterie or Copenhagen’s Gallery. This new show is based at London’s Saatchi Gallery. Check back for live streaming details. London jam packs their week with designer shows…too many to count. Some highlights will no doubt include Christopher Kane, Erdem, Matthew Williamson, Vivienne Westwood Red Label and Mark Fast. Check back for live streaming details. 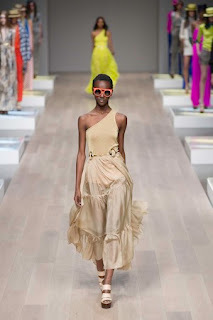 Gucci, Pucci, Prada and Jil Sander are just the tip of the Milano iceberg. 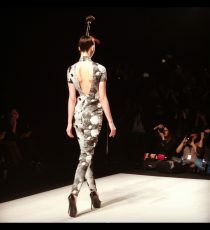 For insider reports from the Milan shows, follow Flare Magazine’s @LisaTant on Twitter. Check back for live streaming details. There is no other city who can compete with Paris on fashion: Dior, Balmain, Lanvin, Balenciaga, Comme des Garcons, YSL, Jean Paul Gaultier, Galliano, McQueen and of course Chanel. (In case you missed it, check out Jeanne Beker’s interview with Jean Paul Gaultier in the Globe and Mail here.) Check back for live streaming details. And let’s not forget our Canadian shows. 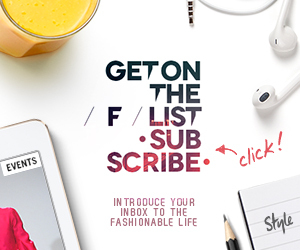 Check back for designers and live streaming information. More to come!